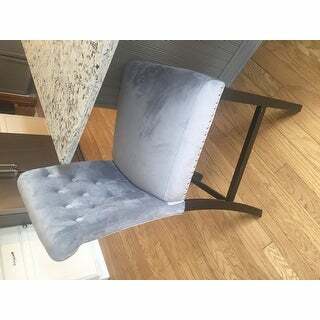 Got the navy chairs and they look beautiful. The wood legs seem like they might chip easy, but I’ve only had them for a few weeks so we will see. Assembly according to my husband was a bit difficult, but managed to get all 4 chairs we bought together in probably an hour and a half. So far, I would buy again. Lots of compliments received. 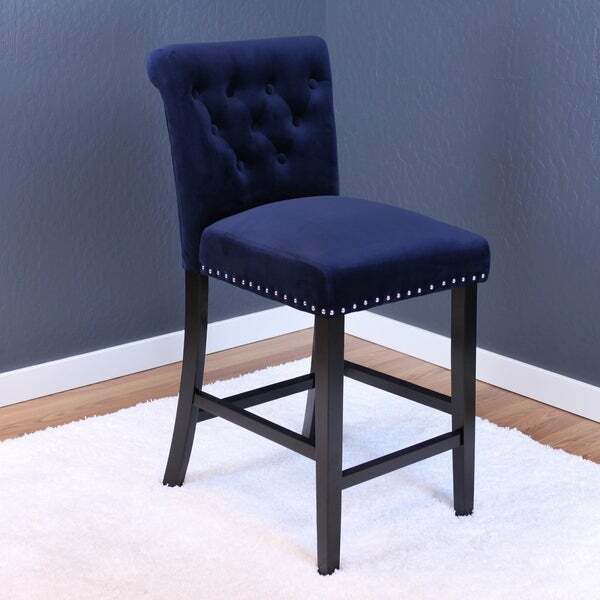 The Markelo Counter Chairs feature button tufted Dutch velvet upholstery and durable wood construction. These chairs are extremely sturdy and comfortable. They come in an assortment of colors with chrome nailhead trim to complement your kitchen's transitional style. Dimensions 23.0 In. X 19.0 In. X 41.0 In. 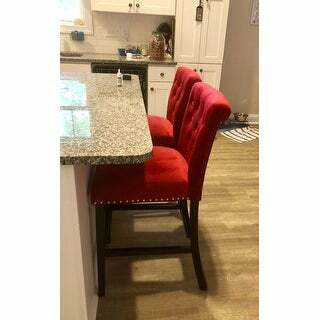 I just love the color of these beautiful counter chairs. Easy to assemble and very sturdy. The chairs are beautiful but the assembly process was a joke! The instructions are all but helpful. It took me 3 hours to assemble both chairs. Also I had to use a screw driver and notch out some of the holes for screws bc they weren't big enough for the hardware. I ordered these because of the dark navy color. It is perfect. I also love the nail heads and tufted back. Glad I bought these. They were a bargain...quite sturdy, too. the counter stool is smaller than i thought. i have to return my counter is 46 inches and the stool suppose to be 40inches. However the black velvet is beautiful. 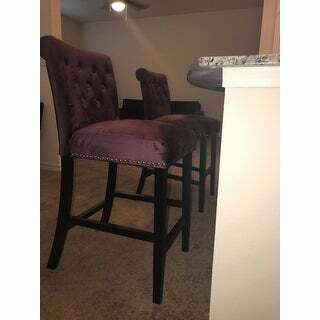 I received my plum wine barstool chairs they are as beautiful as pictured, excellent quality velvet material, very sturdy & my fiancé had no issues with assembly! 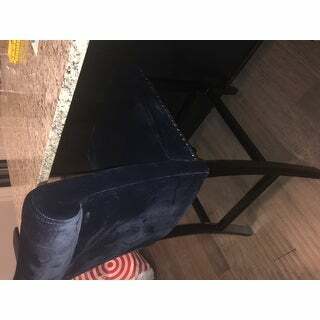 I was looking for barstool chairs to match my velvet eggplant purple living room coaches although the color isn’t as vibrant as photographed it does blend well. Overall I am happy with my purchase & highly recommended these barstool chairs, they’re definitely great quality! The holes didn't line up. 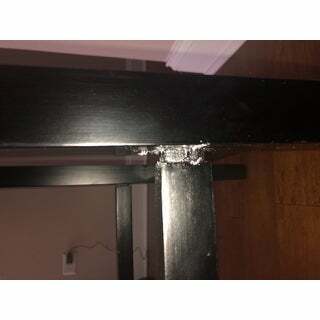 The support rungs on both chairs had snapped and looked like they'd been glued back together...so they just snapped again when I tried to assemble them. The legs also scratch really easily. Very disappointed. I returned them. Gorgeous chairs. Ordered 4 in the Sharkfin Grey. Color is just like picture and the velvet is rich and luxurious. They are not the easiest to assemble so if you are not handy you will need some help. I put all 4 together by myself using only the tools provided (which are located inside the seat portion under the velcro). VERY IMPORTANT! Pay attention to the instructions. Do not overtighten the screws on the legs otherwise it will be difficult to insert the side parts. To level the chair get someone to sit in it while you do final tightening of the bolts. Despite being made in China these chairs do not look or feel cheap. Quality is good and the style fits any modern/mid-century modern decor. 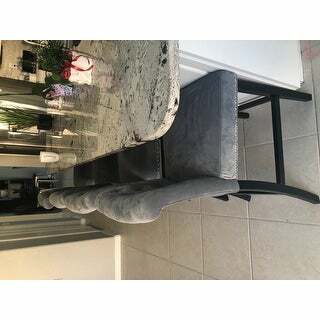 Gorgeous counter stools for my remodeled kitchen. 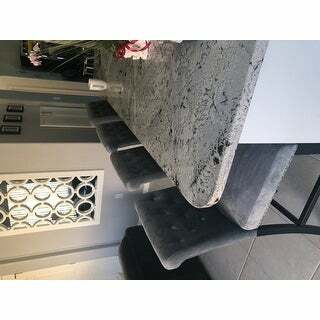 Soft beautiful grey microfiber/“velvet”, and nice quality tufting. Takes some patience to ensure the legs are balanced so no wobbling, but typical ease of putting together Overstock furniture. Would buy again. Many compliments and comfortable to use. These stools are beautiful! They are comfy and sturdy. I’ve been searching for a year for the perfect stool for my counter and finally found these. The color is the perfect shade of gray and the fabric is plush and soft. They were fairly easy to put together as well. These are wicked easy to put together and very comfortable. I was concerned because I didn’t get a swivel seat, but am very pleased with how nice and plush and sturdy they are !! 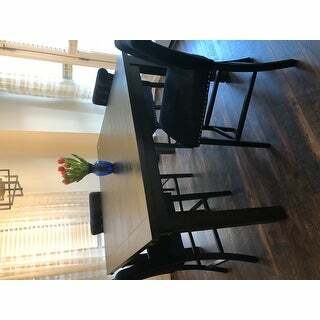 The chairs are beautiful and fit perfectly with my table. I will say, though, they took a long time to assemble. The legs are uneven on 3 of 4 chairs. It isn’t terrible but they do wobble, like you want to grab a sugar packet to put under them. Beautiful and great quality. The material is super soft and very comfortable. Assembly was really easy. The only down side is it is a dog hair magnet. Thank you Overstock! This is exactly what I wanted. I’m so happy I’m always able to find great products at low prices. It’s literally a one stop shop. All of my items are always packaged right and arrives on time. 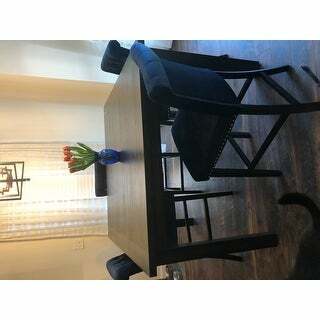 I love my new dining room chairs! These chairs look amazing but the lack of through instructions was a nightmare. The legs look even then once you move the chair they were not even! So frustrating but they’re sturdy and as long as they’re not as used as a rocking chair, there should be no issues. Patience when putting these together UPDATE: one week later the horizontal legs fell off and won’t stay in place! I had to use gorilla glue and they legs still won’t stay in place. The manufacturer dropped the ball on these. They look nice but not worth it. Sending them back! So disappointed! Purchased these for my kitchen island in black. They are exactly as pictured and the velvet is a good fabric. They were fairly easy to put together and arrived not damaged. So far so good and they are sturdy. Should have came with better lock washers. Once replaced very sturdy. Highly recommend. I don’t recommend these chairs at all! The box came with uneven parts for the legs. Now I have wobbly chairs that I cannot do anything with. What a shame! These are gorgeous chairs to look at. The quality however is a different story. The legs were dinged in a few spots and they are really wobbly and uneven. First chair went together great, easy. Second chair took over and hour, and the others almost as much time. I think they are a little pricey for the quality but I kept them because they look nice and are manageable. "is the navy blue color still an option?" "What is the height from floor to top of the seat back (top to bottom)." "What are the dimensions of the chair legs at the bottom? I’m looking for risers to attach and I don’t want to buy too large of a fit for the legs. " "Are the plum wine chairs out of stock? If not how can I order the plum wine set?" "Are these chairs sold in pairs?" Yes, these are a set of two. 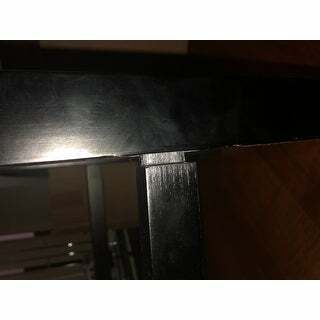 "Do these counter height chairs have silver nail heads in the Gray and the purple?I saw a photo that customer took and they looked brass"